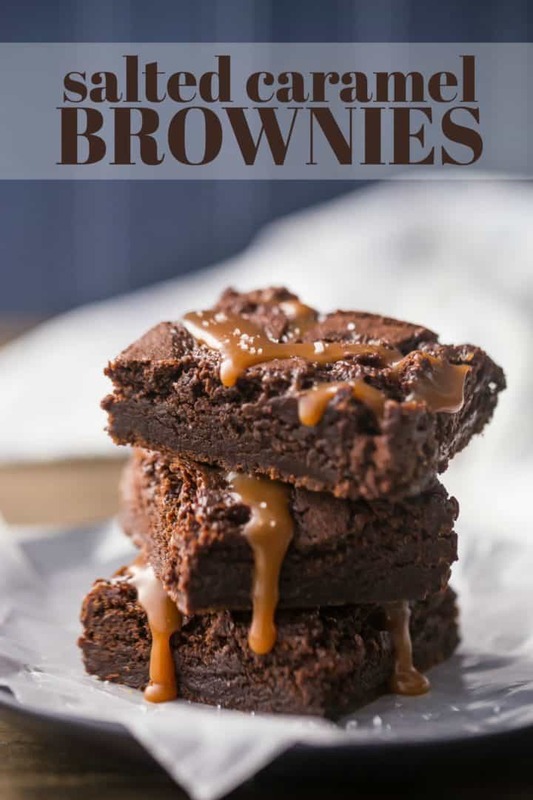 This recipe takes 2 of my absolute favorite things: fudgy chocolate brownies and buttery salted caramel, and puts them together for a dessert that will totally blow your mind! Salted caramel brownies, man. I’m not kidding! These are so incredibly decadent. They are a must-make. I insist! It’s as simple as layering the best-ever salted caramel sauce into my favorite one-bowl brownies from scratch. The brownie recipe is so dang simple, and the flavor is completely off the charts. So incredibly chocolate-y! And the texture is on point: moist and deeply fudgy, with a little bit of delicate crunch on the top. Once you try it you’ll never go back to the box mix! But you should definitely start with the caramel. Pop a little pot on the stove and add your cream, butter, and salt. Let it warm up until the butter is melted and the salt is dissolved. In a bigger pot, melt the sugar, corn syrup, and water. Swirl the pot every now and then, to keep things heating evenly, but don’t stir! If you do, the sugar could crystallize. A gentle swirl is all that’s needed! After a while, the sugar mixture will start to bubble up, then the bubbles will get smaller and slower, and it will start to turn brown. Once it reaches an amber color, pour in the warm cream mixture. It will bubble up like crazy! Just take the pot off the heat and whisk it vigorously, to avoid any lumps. Then add the vanilla and pour it into a heat-safe vessel to cool. While the caramel cools down, you can make the brownies. Just add sugar, butter, and cocoa to a big bowl and microwave it until the butter is melted. (If you don’t have a microwave, you can heat everything over a double-boiler.) Then, add the eggs, one at a time, stirring until completely incorporated. You’ll notice the batter starts to get really thick and glossy. Stir in the vanilla, then the flour, baking powder, and salt. That’s all there is to it! Layer about half the brownie batter into a greased pan, then top with about a third of the caramel. Sandwich another layer of brownie batter on top, and drizzle on more caramel. These will bake in the oven until the edges are set, but the middle will remain pretty soft. Once they’ve cooled completely, you can cut them into bars. And then drizzle them with more salted caramel sauce. It’s to die for!! HOW LONG WILL SALTED CARAMEL BROWNIES LAST? 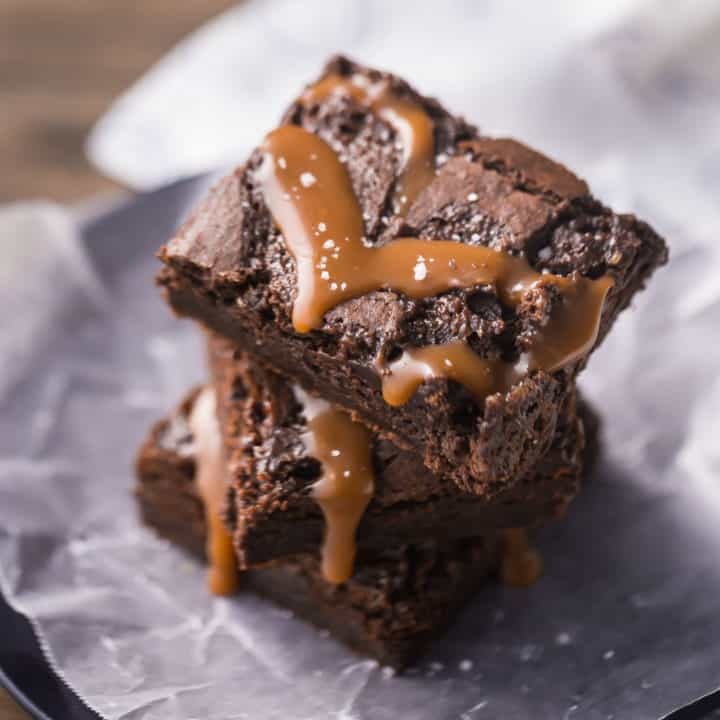 These salted caramel brownies will keep at room temperature for several days. Just be sure to cover them tightly, so they don’t get dried out. In the fridge, they’ll last for at least a couple of weeks. CAN SALTED CARAMEL BROWNIES BE FROZEN? If you’d like to make these ahead, you totally can. Once they’ve completely cooled, they can go into the freezer. They will last for several months there, just be sure they are tightly wrapped. It’s probably best if you freeze them “naked,” in other words, don’t add that last drizzle of caramel sauce until you’re ready to serve them. The caramel sauce keeps at room temperature for several months, so just pop it in a little jar, and once your brownies have thawed, cut them into bars and garnish away. They’ll be fresh as the day they were made. 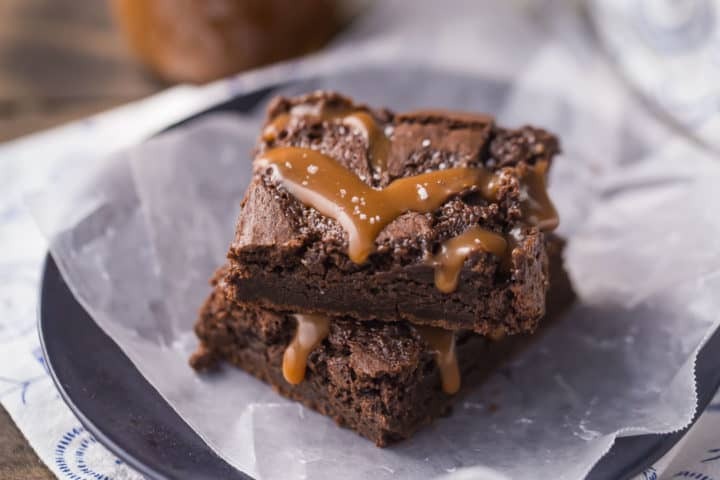 So next time that chocolate craving hits, indulge with a pan of these incredible salted caramel brownies! They’ll definitely hit the spot! Preheat the oven to 325 degrees F, and mist a 9 by 13-inch pan with non-stick spray. Line with parchment. Place the sugar, butter, and cocoa in a large microwave-safe bowl, and microwave* in one-minute increments, stirring, until the butter is completely melted and the mixture feels very warm to the touch. Transfer half the batter to the pan, then drizzle with about 1/3 of the salted caramel. Top with remaining brownie batter, and swirl about 1/3 of the salted caramel mixture on top. Bake for 45-60 minutes, or until set around the edges but still soft towards the middle. Drizzle with remaining caramel and garnish with sea salt. *This step can also be done over a double boiler. For more info on the brownies, click here: Simply Perfect Brownies from Scratch. For more info on the caramel, click here: Simply Perfect Salted Caramel Sauce. Can anything taste better than chocolate and caramel?? I think not. 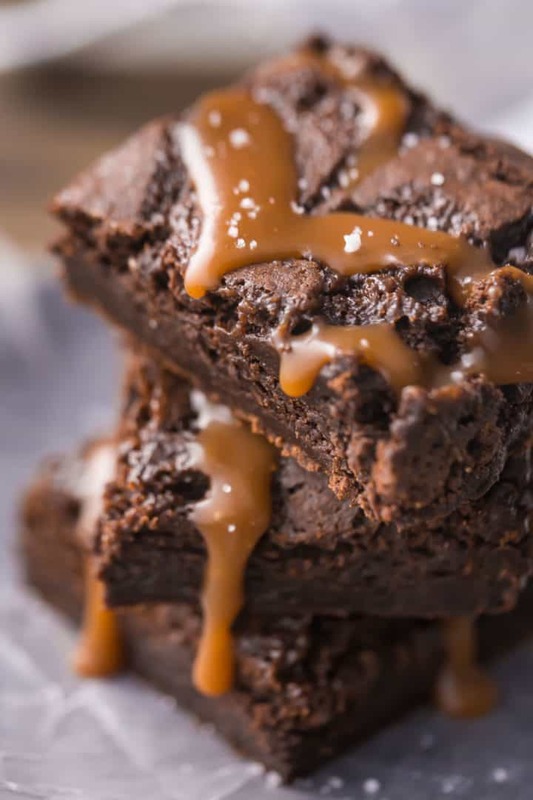 These salted caramel brownies look crazy delicious!